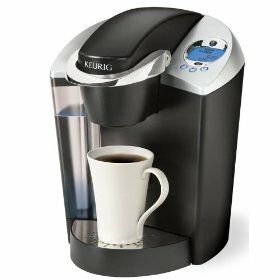 I am totally satisfied with my Keurig B60 Special Edition Gourmet Single-Cup Home-Brewing System. I bought it over Amazon, and all I can say is that I love this coffee machine. The features of this coffee machine is so easy to understand, no more complicated buttons just like on the other machine that I own. The brewing time is about 5 minutes and the coffee comes out great tasting. I love the idea that this is a single cup brewer because I live alone and I do not need to make lots of coffee. So I just brew for one cup, and I put my cup underneath the dripper. It is less messy, I just pop my cup in the dishwasher and head to the office. I am really impressed with all the latest technology people put into some tea and coffee makers to make it so easy for the end users. Join in and write your own page! It's easy to do. How? Simply click here to return to Gourmet coffee makers.